1.materials:as per our client's requirement. 1.Materials can use in PVC,PET,PP,PS,APET,PLA and PETG. 2.Various kinds of design,different shape & sizes. 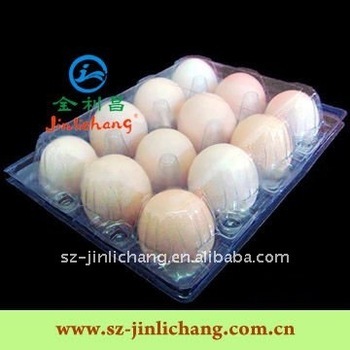 3.Clamshell clear plastic container and Egg blister pack tray. We can make blister packing,blister covers,folding boxes,blister tray,transparent box,blister holder,blister clamshell&tube blister according to the customers requirement. Jinlichang Plastics is a Gold Supplier of Plastic packaging products of alibaba. Our factory was established in 1997, professional in designing and producing different kinds of plastic trays, blisters and boxes(containers) in PP, PS, PVC, APET,PETG etc. materials. The supplier is ranked number 10 by reviews data in Packaging Boxes. The supplier is ranked number 5 by transactions data in Packaging Boxes. The supplier has delivered 81.8%% of their orders on-time in the last 180 days.